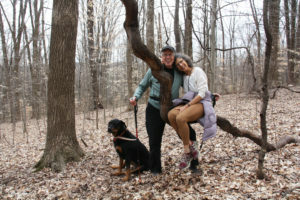 Sycamore members Malcolm Dalglish and Judy Klein and their dog Lola at Porter West Preserve. There’s nothing like enjoying the great outdoors with a good hike, and nothing makes it better than with our best friends — dogs. They appreciate the experience of meandering through the woods as much as us we do, but in order to make it safe and enjoyable for everyone, please be sure you keep our dogs close by and on a leash. There are several reasons to always keep your dogs leashed and under control when visiting Sycamore’s preserves. 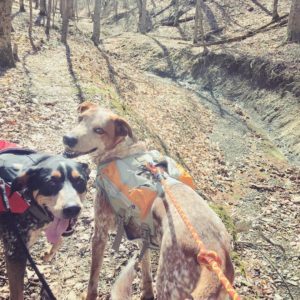 Just as hikers ought to stay off the trail, so should the pups we bring with us. While our canine friends are animals too, their curious noses can take them far away. Our preserves are home to many species of animals and plants that are best kept untouched and undisturbed. Unnecessary trampling of plants can cause harm. Norbert and Bugg taking a hike at Laura Hare Nature Preserve at Downey Hill with Instagrammer @momi_n_the_boys. Dogs can pick up some unpleasant things when they go off the trail and find themselves in the thick of the woods. Fleas, ticks, poisonous spiders, and other insects may be hitching a ride on your dog. Even infectious diseases can be picked up in natural areas, particularly those found in water. Not only that, their fur can easily collect burrs and other hard-to-remove plant material that is best left where it was found. Sycamore’s own Jack Henkel (puppy of Abby Henkel) enjoying a snowy hike in January. Indiana is home to some poisonous snakes that might be hiding in the underbrush ready to strike. Venomous snakes like northern copperheads and the endangered timber rattlesnake make their home in Southern Indiana. It’s always important to watch out for snakes for your sake and that of your dog. Some dogs just can’t resist saying hello to just about everybody. However, it’s best to keep your dog on a leash to avoid any unwanted conflicts with those nearby, including other dogs. Be sure to greet others you come across along the way, and inform them about your dog’s behavior. Devlin Stalion (@devlinstalion) and his dog enjoyed a misty hike at the Amy Weingartner Branigin Peninsula Preserve. 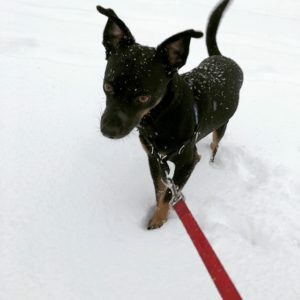 Sometimes dogs can get lost romping through the woods, or even jumping from cliffs, hopping into creeks and bodies of water, into unreachable areas where they can get stranded. Many of our preserves have bluffs, cliffs, and other features that no human or dog should enter. Keep your dogs close by and leashed so they don’t end up in any sticky situations. 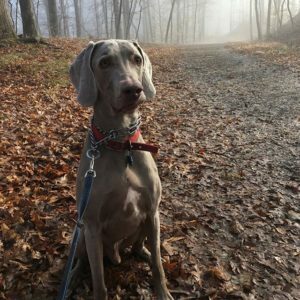 State law requires that dogs remain leashed, even at nature preserves, in order to minimize the impact on nature and to make sure the visitation experience is best for everyone.